Chiquito offers great value, authentic Mexican food in a fun and lively venue, with great Latin American music. Chiquito is one of the most family friendly establishments I have ever been to. My kids just love the food; building their own fajita may be messy, but it sure keeps them occupied. This Mexican restaurant chain opened its Glasgow branch in Xscape (Braehead) in March 2006, and there is also a restaurant in Springfield Quay. In both restaurants, the service is normally great with friendly staff, and there is a good party atmosphere in the place. The cocktails, although standard, are pretty good (which probably adds to the party atmosphere). Portion sizes are colossal, but on occasion the food wait times can be a bit long. The food in Chiquito is not by any means Michelin Star standard so steer clear if you only eat gourmet; but it definitely fills your belly. One thing I will say is that although Chiquito in Springfield Quay is nice, the service and food in their restaurant in Xscape at Braehead is much better. So I would recommend going to Chiquito Xscape over Chiquito Springfield Quay. I would recommend booking in advance or going a bit early if it is the weekend as it can get pretty busy in both restaurants. Myself and my partner went to Chiquito’s at Springfield Quay last night, 12th May 2008, on this recommendation. I took along two quests. I can only say the quality of food was abominable! We waited an hour and a half for our main mail which was cold on arrival! I did not get what I ordered. The bottled of wine we had ordered to have with our meal was well finished by the time our food arrived. I certainly will not be recommending it to anyone, infact quite the opposite. What a disappointment! Took my girlfriend to chiquitos at the quay for her birthday and it was fantastic. The food was great and so was the service top notch all round . I decided to pop into chiquitos prior to a visit to the pictures-unfortunately i never got as far as to see the film. I was the only customer in the restaurant at 5pm and ordered the meatballs in a chipotle sauce. The dish arrived approx 3 minutes later. The meatballs were straight out of a tin (the waiter confirmed this) the rice was hard and certainly had been re-heated. I had to request a portion of sour cream and cheese if only to mask the flavour and texture of the bland processed meatballs. I managed to hold down a couple of mouthfulls before asking the waiter for my bill. At ten pounds including a coke this was not a cheap meal but certainly cheap to make-the food was foul and not only did i feel completely ripped off i was also left with a sick feeling in my stomach and could not make the pictures. Beware!!! I visited this restaurant on 17/10/09 with my husband and 2 kids after a night at the Odeon cinema which is within the same complex at the quay. We were very impressed with the menu which caters for all tastes. They offer mainly mexican dishes or deep south inspired options but also the usual fish & chips for the less adventurous diner. They have a seperate kids menu priced at £4.75 for a main, a dessert & a drink. The kids get a balloon, activity pack and a free portion of veg with their main meal if desired. We found the staff friendly and efficient. There was no long wait between ordering and serving of food or drinks. The atmosphere was relaxed and welcoming. There was a CD played throughout the night. The mainly latino style music all added to the authenticity of the place. I had the shrimp salad to start which was a nice variation on a prawn cocktail. I ordered the mexican paella as my main course. They mussels were huge, the calamari was really nice. All in all I was really happy with my food and had no complaints at all. The kids had chicken fajitas which came with cheese, veg & salsa. All the bits & pieces came in seperate dishes and they enjoyed the fun element of making up their own wraps. The long island ice tea cocktails were amazing. We all thoroughly enjoyed our meals and the entire experience. At a cost of almost £60 for the 4 of us I would say it was very reasonably priced and will definitely visit again soon. I think Chiquitos is just fantastic! I took my 2 kids there and they loved it and so did I! Because my kids loved it so much they want to go there and eat everyday! The staff were very quick with the food and belive me my kids kids get angry when they have to wait to long but they were very happy. My kids said to me that they loved the deserts to. The staff are very nice and kind too. I would defenatly go back and eat at chiquitos! My wife & I went here, pre-concert in Glasgow. I ordered a medium-rare steak and my wife had chicken. It took 50 minutes for the food to arrive, in a mostly empty restaurant. As expected, the steak was cut open in one corner to reveal the middle. However, it was well-done, not medium-rare. I sent it back. My wife’s chicken then arrived and it was dry, with a rubbery, unchewable texture. I called the waiter, cancelled the meal and pai only for the bottle of wine. They need to employ someone who can cook. The worst food ever. Love the lunch menu at this place! Great for kids too – fast food, and good service. 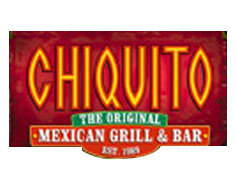 I’ve been going to chiquitos for a few years now the service is excellent and the food is delicious. Such a rip off, for food that is cheap to produce they sure do like to charge stupidly high prices for it. £4.49 for four little chilli poppers that likely came from the freezer? £8.50 for a sloppy bean burger and some undercooked hard chips? Their beer prices are bordering on the insane, averaging £3.99 for a wee bottle, not even a pint. Total rip off, that combined with the lazy service and the waitresses who glare at you when you don’t want to order a rip off desert. There are much better and much cheaper places to eat. Went to the restaurant at escape with a friend to celebrate some good news. On taking my first bite of the main meal felt intense pain, I thought that a tooth had come out but soon discovered that I had broken my tooth on a foreign object in the meal. I was informed by the waitress that this had come from the black beans which they had received from a new supplier, I got the impression that I had not been the first casualty! Celebration cut short, a night of pain, a day off work and an emerging visit to the dentist and financial loss was the result! Many phone calls and emails later resulted in almost 2 months later receiving vouchers for free food at the restaurant, frankly as I told their area manager this is the last thing I had any interest in. I have still not received the outcome of the investigation into the foreign object and im doubtful I ever will. My advice to everyone thinking of eating here is don’t do it! No interest in customer service only making money.